Alex is interested is in using DES to understand the fundamental nature of dark matter. His research focuses finding and studying Milky Way satellite galaxies, which are the smallest and most dark-matter-dominated galaxies known. The proximity, simplicity, and high dark matter content of these systems makes them ideal laboratories for testing the fundamental properties of dark matter. Alex’s background is in experimental astrophysics, and he is involved in many aspects of DES operations, data process, and data analysis. 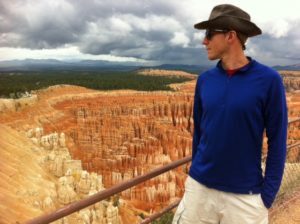 Alex is co-convener of the Milky Way Science Working group and has previously served as coordinator of the Science Release Group. The freedom to choose what I work on and the fact that my job is also my favorite hobby. I’m a pretty serious ultimate frisbee player. I’ve competed in the US National Championships at the college and club level. I also played semi-professionally for three years in Chicago. I got paid enough to buy a couch! 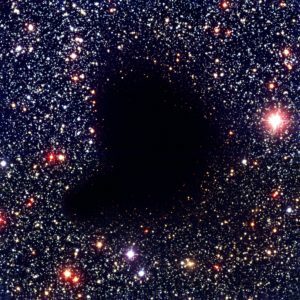 I have always been really struck by Barnard’s Cloud (Barnard 68, right). A reminder that the absence of evidence is not the evidence of absence. What do you think has been the most exciting advance in science / technology in the last 10 years? I am continually amazed by the growth of the internet and the technology that we use to access it. Having nearly ubiquitous and instantaneous access to so much knowledge is quite a revolution! Science, at least the kind that we do in DES, is a very social job. Find people that you like working with.